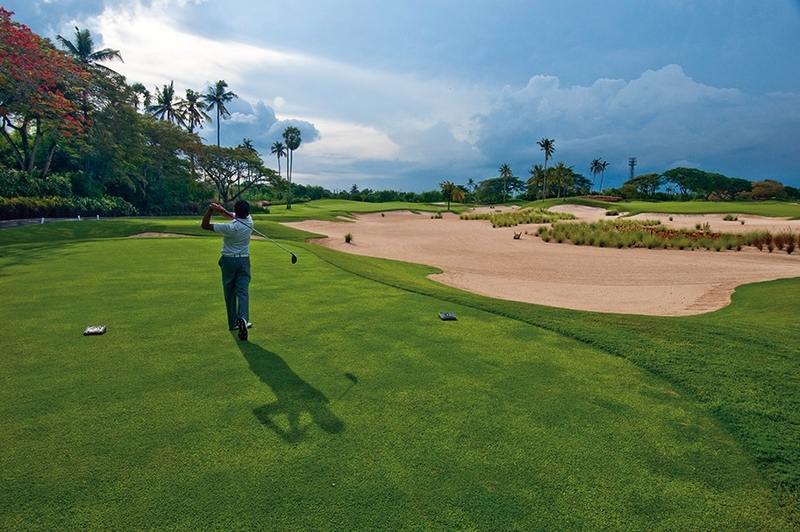 Bali Golf & Country Club features a spectacular 18-hole course designed by Nelson & Wright, and featured in Fortune Magazine as one of the five best golf courses in Asia! Holes 1 through 9 feature creeks, canyons, and native vegetation filled with tropical birds. Holes 10 through 16 greet you with with lush, gently-sculptured fairways winding through a mature coconut grove. On holes 17 and 18, you'll experience a breathtaking seaside environment. Official Course Record - 63, Nick Faldo, Alfred Dunhill Masters, November 4, 1994.
. Balinese style, well appointed clubhouse featuring an open-air restaurant with spectacular views of the Indian Ocean, two bars, and two halfway houses with food and drink service.
. Ceremonies, luncheons, business retreats, and other group functions, small and large, elegantly catered.
. Locker rooms and golf-bag storage.
. PGA golf professional staff for private and group lessons, tournaments, and organized group events.
. Two practice putting greens and chipping green.